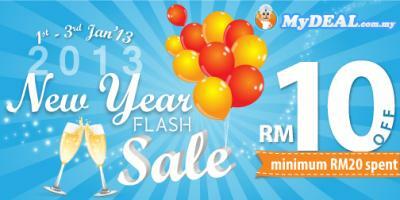 New Year Gift from MyDEAL: Get a Free RM10 Voucher & Enjoy Your New Year Celebrations! Get a Free RM10 Voucher from MyDEAL! Free RM10 Voucher with Minimum Spending of RM20 on MyDEAL.com.my! Enjoy the offer from 1 Jan 2013 to 3 Jan 2013. Voucher may only be used once per customer. To redeem, purchase any deal and spend a minimum of RM20, then utilize the voucher code to offset RM10 from your spending. LIKE & SHARE this great offer with your friends!